Týr is the god of war, law, valour, and glory in the Æsir pantheon. He may be the son of Óðin or of the jötunn Hymir. His name literally means “god” or “glory” and he is so heavily attested throughout many cultures and historical time periods, that he may very well have either been the head of the pantheon at one time, or adopted in and integrated such as gods like Freyr and Ullr. His rune, also named for him, was carved by warriors into the hilts and blades of their swords to honour him in battle and to entreat his favour. Týr’s most celebrated story concerns the loss of his right hand. As Loki’s son, Fenrir grew to enormous size, the gods began to fret about the future of the beast and his growing power. A bold and brazen young adult, Fenrir was happy to engage the gods in contests of strength, and the Æsir pitted him against every type of binding they could find. None could hold the brute for long. The gods turned to the master dwarfs for help, and out of impossible elements – the sound of a cat’s footfall, the beard of a woman, the roots of a mountain, bear’s sinews, fish’s breath and bird’s spittle – they created Gleipnir, which appeared as a silken ribbon, but was stronger than steel. Fenrir sensed something amiss when the Æsir challenged him with their flimsy ribbon, but unwilling to pass up another chance to show his might (and embarrass the gods) he agreed to be bound with Gleipnir … on the condition that one of the gods place their hand between his teeth as a sign of good faith. Courageous Týr volunteered, placing his right hand within the wolf’s mouth. Fenrir was bound with the ribbon, and he soon tired of fighting to break free. Realizing that he had been betrayed, the mighty jaw bit down and severed Týr’s hand. Fenrir was bound securely until Ragnarök. Though it was to Fenrir that Týr loses his hand, it is actually the Hel guardian Garm who he faces at Ragnarök, and they are destined to kill one another. He is sometimes confused with Óðin, even in old Norse and Germanic sources. One example of this is one of Óðin’s names – Hangatyr, which means “god of the hanged” and could either reference the All Father’s self-sacrifice by hanging upon the branch of Yggdrasil, or could be an allusion to Týr’s role as a god of justice. Týr sacrifices his hand, not for glory’s sake, but for fidelity to his kin and their oath to protect the world. In much the same way as Thor battling the Jötnar, Týr’s contribution to the war against total chaos is his part in the binding of Fenrir, a destructive force to be reckoned with. He does this with integrity and courage, without hesitation. It is simply something that needs to be done in order to serve his kin – and it is in this selfless act that he gains honour and glory. Hands, bindings, cords, swords and weaponry. The day Tuesday. 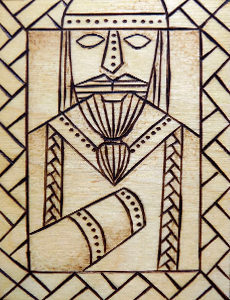 The rune Týr. Colours dark red, dark grey and sky blue. Holly, the Irminsul and the sky. Teiws, Tīw, Ziu, Cio, Tīwaz, Tius, Tio, Tuisto, and Mars Thincsus.